Ophelia here with another Artist Gang Tuesday blog post. For todays journal play, I was completely inspired by the Artist Soul stencil, and the new Dylusions paints that I received. I ended up playing around with a bunch of other stencils that I had and found that these stencils work so very well together. The colors of these paints remind me of Spring, and was the perfect inspiration for creating this page. 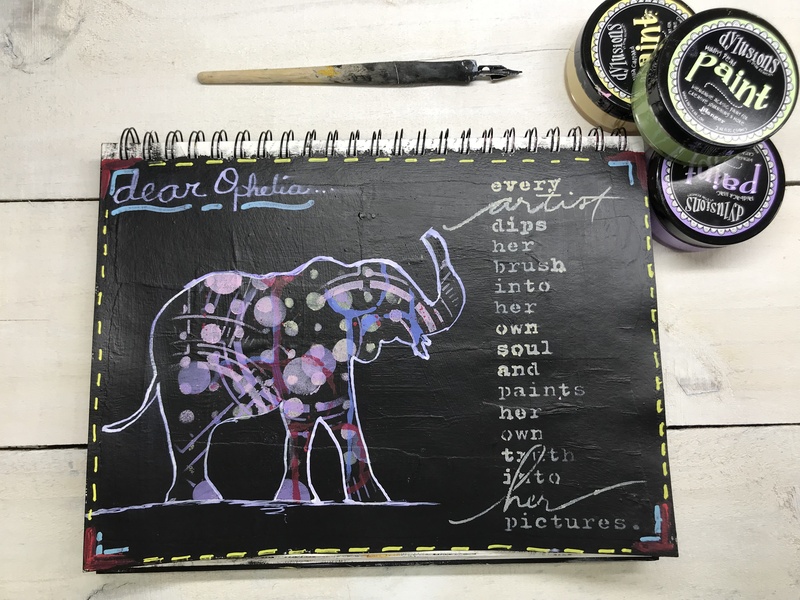 The quote from the Artist Soul stencil along with the Good Luck Elephant stencil were exactly what I needed to express where I am in my art journey. Elephants simply remind me of strength, and I am feeling that I want to use this quote on everything!! I hope that you enjoy todays video. The colors ended up being a bit softer than I really wanted, but this is all about play and experimentation for me. I hope that you find the time spent in your journals the same....enjoy the process over what the finished page looks like. Acrylic Paint Pens in a variety of colors - clearly here, I need to replace the ones that I own. Thanks so much for your visit today...grab your stencils, favorite paints, and play!! !